Patent foramen ovale (PFO) is a flaplike opening between the atrial septa primum and secundum at the location of the fossa ovalis (see the image below) that persists after age 1 year. With increasing evidence being found that PFO is the culprit in paradoxical embolic events, the relative importance of the anomaly is being reevaluated. Most patients with a patent foramen ovale (PFO) as an isolated finding receive no special treatment. No consensus exists on the treatment of PFO in patients with transient ischemic attack or stroke. When PFO is associated with an otherwise unexplained neurologic event,  traditional treatment has been antiplatelet (ie, aspirin) therapy alone in low-risk patients or such therapy combined with the use of warfarin in high-risk individuals, to prevent cryptogenic stroke. Surgical closure of PFO with double continuous suture has resulted in elimination of residual shunt across the PFO. Patent foramen ovale (PFO) is an anatomical interatrial communication with potential for right-to-left shunt. Foramen ovale has been known since the time of Galen. In 1564, Leonardi Botali, an Italian surgeon, was the first to describe the presence of foramen ovale at birth. However, the function of foramen ovale in utero was not known at that time. In 1877, Cohnheim described paradoxical embolism in relation to PFO. See also the Medscape Drugs & Disease articles Atrial Septal Defect and Pediatric Atrial Septal Defects. Patent foramen ovale (PFO) is a flaplike opening between the atrial septa primum and secundum at the location of the fossa ovalis that persists after age 1 year. In utero, the foramen ovale serves as a physiologic conduit for right-to-left shunting. Once the pulmonary circulation is established after birth, left atrial pressure increases, allowing functional closure of the foramen ovale. This is followed by anatomical closure of the septum primum and septum secundum by the age of 1 year. With increasing evidence that PFO is the culprit in paradoxical embolic events, the relative importance of the anomaly is being reevaluated. James Lock, MD, postulated that PFO anatomy results in a cul-de-sac between the septa primum and secundum, predisposing individuals to hemostasis and clot formation. Any conditions that increase right atrial pressure more than left atrial pressure can induce paradoxical flow and may result in an embolic event. This reasoning has greatly altered the previous conception of PFO and is changing current management of the condition. Patent foramen ovale (PFO) is detected in 10-15% of the population by contrast transthoracic echocardiography. Autopsy studies show a 27% prevalence of probe-patent foramen ovale. This difference is probably due to the ability to directly visualize PFO on autopsy study, while contrast echocardiography relies on detection of secondary physiologic phenomena. The prevalence and size of probe-patent PFO is similar in males and females. The prevalence of PFO declines progressively with age—34% up to age 30 years, 25% for age 30-80 years, and 20% older than 80 years. 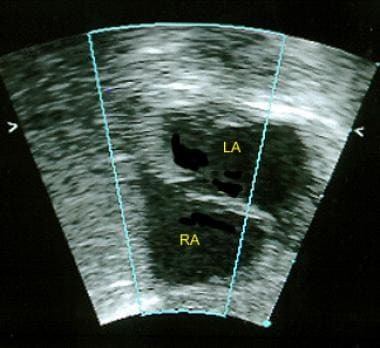 Agostoni P, Gasparini G, Destro G. Acute myocardial infarction probably caused by paradoxical embolus in a pregnant woman. Heart. 2004 Mar. 90(3):e12. [Medline]. [Full Text]. Diaz Castro O, Bueno H, Nebreda LA. Acute myocardial infarction caused by paradoxical tumorous embolism as a manifestation of hepatocarcinoma. Heart. 2004 May. 90(5):e29. [Medline]. [Full Text]. Carey HB, Boltax R, Dickey KW, Finkelstein FO. Bilateral renal infarction secondary to paradoxical embolism. Am J Kidney Dis. 1999 Oct. 34(4):752-5. [Medline]. Pell AC, Hughes D, Keating J, Christie J, Busuttil A, Sutherland GR. Brief report: fulminating fat embolism syndrome caused by paradoxical embolism through a patent foramen ovale. N Engl J Med. 1993 Sep 23. 329(13):926-9. [Medline]. Pellikka PA, Tajik AJ, Khandheria BK, et al. Carcinoid heart disease. Clinical and echocardiographic spectrum in 74 patients. Circulation. 1993 Apr. 87(4):1188-96. [Medline]. Shanks M, Manawadu D, Vonder Muhll I, Khan K, Becher H, Choy J. Detection of patent foramen ovale by 3D echocardiography. JACC Cardiovasc Imaging. 2012 Mar. 5(3):329-31. [Medline]. Kerr AJ, Buck T, Chia K, et al. Transmitral Doppler: a new transthoracic contrast method for patent foramen ovale detection and quantification. J Am Coll Cardiol. 2000 Nov 15. 36(6):1959-66. [Medline]. Di Tullio M, Sacco RL, Venketasubramanian N, Sherman D, Mohr JP, Homma S. Comparison of diagnostic techniques for the detection of a patent foramen ovale in stroke patients. Stroke. 1993 Jul. 24(7):1020-4. [Medline]. Steenblik MH, Mineau GP, Pimentel R, et al. Population-based assessment of familial inheritance and neurologic comorbidities among patients with an isolated atrial septal defect. Congenit Heart Dis. 2009 Nov. 4(6):459-63. [Medline]. Bonati LH, Wetzel SG, Kessel-Schaefer A, Buser P, Lyrer PA, Engelter ST. Diffusion-weighted imaging findings differ between stroke attributable to spontaneous cervical artery dissection and patent foramen ovale. Eur J Neurol. 2010 Feb. 17(2):307-13. [Medline]. Schneider B, Hofmann T, Justen MH, Meinertz T. Chiari's network: normal anatomic variant or risk factor for arterial embolic events?. J Am Coll Cardiol. 1995 Jul. 26(1):203-10. [Medline]. Khositseth A, Cabalka AK, Sweeney JP, et al. Transcatheter Amplatzer device closure of atrial septal defect and patent foramen ovale in patients with presumed paradoxical embolism. Mayo Clin Proc. 2004 Jan. 79(1):35-41. [Medline]. Attenhofer Jost CH, Connolly HM, O'Leary PW, Warnes CA, Tajik AJ, Seward JB. Left heart lesions in patients with Ebstein anomaly. Mayo Clin Proc. 2005 Mar. 80(3):361-8. [Medline]. Sloan MA, Alexandrov AV, Tegeler CH, et al. Assessment: transcranial Doppler ultrasonography: report of the Therapeutics and Technology Assessment Subcommittee of the American Academy of Neurology. Neurology. 2004 May 11. 62(9):1468-81. [Medline]. Thaler DE, Ruthazer R, Di Angelantonio E, et al. Neuroimaging findings in cryptogenic stroke patients with and without patent foramen ovale. Stroke. 2013 Mar. 44(3):675-80. [Medline]. [Full Text]. Dalen JE, Alpert JS. Cryptogenic strokes and patent foramen ovales: what's the right treatment?. Am J Med. 2016 Nov. 129(11):1159-62. [Medline]. Polzin A, Dannenberg L, Sophia Popp V, Kelm M, Zeus T. Antiplatelet effects of clopidogrel and aspirin after interventional patent foramen ovale/ atrium septum defect closure. Platelets. 2016 Jun. 27(4):317-21. [Medline]. Mirzaali M, Dooley M, Wynne D, et al. Patent foramen ovale closure following cryptogenic stroke or transient ischaemic attack: Long-term follow-up of 301 cases. Catheter Cardiovasc Interv. 2015 Nov 15. 86(6):1078-84. [Medline]. Rigatelli G, Dell'Avvocata F, Giordan M, et al. Transcatheter patent foramen ovale closure in spite of interatrial septum hypertrophy or lipomatosis: a case series. J Cardiovasc Med (Hagerstown). 2010 Feb. 11(2):91-5. [Medline]. Neuser J, Akin M, Bavendiek U, Kempf T, Bauersachs J, Widder JD. Mid-term results of interventional closure of patent foramen ovale with the Occlutech Figulla® Flex II Occluder. BMC Cardiovasc Disord. 2016 Nov 10. 16(1):217. [Medline]. Apostolopoulou SC, Tsoutsinos A, Laskari C, Kiaffas M, Rammos S. Large single centre experience with the Cera™ and CeraFlex™ occluders for closure of interatrial communications: usefulness of the flexible rotation feature. Cardiovasc Interv Ther. 2016 Nov 10. [Medline]. Maffe S, Dellavesa P, Zenone F, et al. Transthoracic second harmonic two- and three-dimensional echocardiography for detection of patent foramen ovale. Eur J Echocardiogr. 2010 Jan. 11(1):57-63. [Medline]. Adams HP. Patent foramen ovale: paradoxical embolism and paradoxical data. Mayo Clin Proc. 2004 Jan. 79(1):15-20. [Medline]. Bogousslavsky J, Garazi S, Jeanrenaud X, et al. Stroke recurrence in patients with patent foramen ovale: the Lausanne Study. Lausanne Stroke with Paradoxal Embolism Study Group. Neurology. 1996 May. 46(5):1301-5. [Medline]. Bridges ND, Hellenbrand W, Latson L, et al. Transcatheter closure of patent foramen ovale after presumed paradoxical embolism. Circulation. 1992 Dec. 86(6):1902-8. [Medline]. [Full Text]. Cheng TO. Transcatheter closure of patent foramen ovale: a definitive treatment for platypnea-orthodeoxia. Catheter Cardiovasc Interv. 2000 Sep. 51(1):120. [Medline]. Cujec B, Mainra R, Johnson DH. Prevention of recurrent cerebral ischemic events in patients with patent foramen ovale and cryptogenic strokes or transient ischemic attacks. Can J Cardiol. 1999 Jan. 15(1):57-64. [Medline]. Danzi GB, Sesana M, Capuano C, Baglini R. Percutaneous closure of patent foramen ovale: pathophysiology, indications, and technique. Neurol Sci. 2003 May. 24 Suppl 1:S17-9. [Medline]. Devuyst G, Bogousslavsky J, Ruchat P, et al. Prognosis after stroke followed by surgical closure of patent foramen ovale: a prospective follow-up study with brain MRI and simultaneous transesophageal and transcranial Doppler ultrasound. Neurology. 1996 Nov. 47(5):1162-6. [Medline]. Donnan GA, Davis SM. Patent foramen ovale and stroke: closure by further randomized trial is required!. Stroke. 2004 Mar. 35(3):806. [Medline]. Dubourg O, Bourdarias JP, Farcot JC, et al. Contrast echocardiographic visualization of cough-induced right to left shunt through a patent foramen ovale. J Am Coll Cardiol. 1984 Sep. 4(3):587-94. [Medline]. Fransson SG. The Botallo mystery. Clin Cardiol. 1999 Jun. 22(6):434-6. [Medline]. Furlan AJ. Patent foramen ovale and recurrent stroke: closure is the best option: yes. Stroke. 2004 Mar. 35(3):803-4. [Medline]. Guffi M, Bogousslavsky J, Jeanrenaud X, et al. Surgical prophylaxis of recurrent stroke in patients with patent foramen ovale: a pilot study. J Thorac Cardiovasc Surg. 1996 Aug. 112(2):260-3. [Medline]. Hara H, Virmani R, Ladich E, Mackey-Bojack S, Titus J, Reisman M. Patent foramen ovale: current pathology, pathophysiology, and clinical status. J Am Coll Cardiol. 2005 Nov 1. 46(9):1768-76. [Medline]. Hausmann D, Mugge A, Daniel WG. Identification of patent foramen ovale permitting paradoxic embolism. J Am Coll Cardiol. 1995 Oct. 26(4):1030-8. [Medline]. Homma S, Sacco RL, Di Tullio MR, et al. Effect of medical treatment in stroke patients with patent foramen ovale: patent foramen ovale in Cryptogenic Stroke Study. Circulation. 2002 Jun 4. 105(22):2625-31. [Medline]. Jeffrey S. TCD bests TEE for diagnosis of PFO. Medscape Medical News. February 17, 2014. Available at http://www.medscape.com/viewarticle/820702. Accessed: February 25, 2014. Kerut EK, Norfleet WT, Plotnick GD, Giles TD. Patent foramen ovale: a review of associated conditions and the impact of physiological size. J Am Coll Cardiol. 2001 Sep. 38(3):613-23. [Medline]. Khairy P, O'Donnell CP, Landzberg MJ. Transcatheter closure versus medical therapy of patent foramen ovale and presumed paradoxical thromboemboli: a systematic review. Ann Intern Med. 2003 Nov 4. 139(9):753-60. [Medline]. Kizer JR, Devereux RB. Clinical practice. Patent foramen ovale in young adults with unexplained stroke. N Engl J Med. 2005 Dec 1. 353(22):2361-72. [Medline]. Landzberg MJ, Khairy P. Indications for the closure of patent foramen ovale. Heart. 2004 Feb. 90(2):219-24. [Medline]. Lechat P, Mas JL, Lascault G, et al. Prevalence of patent foramen ovale in patients with stroke. N Engl J Med. 1988 May 5. 318(18):1148-52. [Medline]. Lock JE. Patent foramen ovale is indicted, but the case hasn't gone to trial. Circulation. 2000 Feb 29. 101(8):838. [Medline]. Marie Valente A, Rhodes JF. Current indications and contraindications for transcatheter atrial septal defect and patent foramen ovale device closure. Am Heart J. 2007 Apr. 153(4 Suppl):81-4. [Medline]. Mas JL, Zuber M. Recurrent cerebrovascular events in patients with patent foramen ovale, atrial septal aneurysm, or both and cryptogenic stroke or transient ischemic attack. French Study Group on Patent Foramen Ovale and Atrial Septal Aneurysm. Am Heart J. 1995 Nov. 130(5):1083-8. [Medline]. Meier B, Lock JE. Contemporary management of patent foramen ovale. Circulation. 2003 Jan 7. 107(1):5-9. [Medline]. Meissner I, Whisnant JP, Khandheria BK, Spittell PC, O'Fallon WM, Pascoe RD, et al. Prevalence of potential risk factors for stroke assessed by transesophageal echocardiography and carotid ultrasonography: the SPARC study. Stroke Prevention: Assessment of Risk in a Community. Mayo Clin Proc. 1999 Sep. 74(9):862-9. [Medline]. Mohrs OK, Petersen SE, Erkapic D, et al. Diagnosis of patent foramen ovale using contrast-enhanced dynamic MRI: a pilot study. AJR Am J Roentgenol. 2005 Jan. 184(1):234-40. [Medline]. Ranoux D, Cohen A, Cabanes L, et al. Patent foramen ovale: is stroke due to paradoxical embolism?. Stroke. 1993 Jan. 24(1):31-4. [Medline]. Ruchat P, Bogousslavsky J, Hurni M, et al. Systematic surgical closure of patent foramen ovale in selected patients with cerebrovascular events due to paradoxical embolism. Early results of a preliminary study. Eur J Cardiothorac Surg. 1997 May. 11(5):824-7. [Medline]. Sievert H, Babic UU, Hausdorf G, et al. Transcatheter closure of atrial septal defect and patent foramen ovale with ASDOS device (a multi-institutional European trial). Am J Cardiol. 1998 Dec 1. 82(11):1405-13. [Medline]. Sievert H, Taaffe M. Patent foramen ovale: the jury is still out. Eur Heart J. 2004 Mar. 25(5):361-2. [Medline]. Siostrzonek P, Zangeneh M, Gossinger H, et al. Comparison of transesophageal and transthoracic contrast echocardiography for detection of a patent foramen ovale. Am J Cardiol. 1991 Nov 1. 68(11):1247-9. [Medline]. Slavin L, Tobis JM, Rangarajan K, Dao C, Krivokapich J, Liebeskind DS. Five-year experience with percutaneous closure of patent foramen ovale. Am J Cardiol. 2007 May 1. 99(9):1316-20. [Medline]. Somberg J. Patent foramen ovale closure devices: thoughts from the circulatory device advisory panel. Am J Cardiol. 2007 Sep 1. 100(5):905-6. [Medline]. Stone DA, Godard J, Corretti MC, et al. Patent foramen ovale: association between the degree of shunt by contrast transesophageal echocardiography and the risk of future ischemic neurologic events. Am Heart J. 1996 Jan. 131(1):158-61. [Medline]. Windecker S, Wahl A, Chatterjee T, et al. Percutaneous closure of patent foramen ovale in patients with paradoxical embolism: long-term risk of recurrent thromboembolic events. Circulation. 2000 Feb 29. 101(8):893-8. [Medline]. Rimoldi SF, Ott S, Rexhaj E, et al. Patent foramen ovale closure in obstructive sleep apnea improves blood pressure and cardiovascular function. Hypertension. 2015 Nov. 66(5):1050-7. [Medline]. Pedersen TA, Larsen SH, Nielsen-Kudsk JE. Closure of a patent foramen ovale in patients with platypnoea-orthodeoxia: A rare and overlooked cause of dyspnoea and hypoxaemia. Scand Cardiovasc J. 2015 Dec. 49(6):357-60. [Medline]. Rigatelli G, Zuin M, Pedon L, et al. Clinically apparent long-term electric disturbances in the acute and very long-term of patent foramen ovale device-based closure. Cardiovasc Revasc Med. 2017 Mar. 18(2):118-22. [Medline]. Versaci F, Vizzari G, Sergi D, Ando G, Trivisonno A, Romeo F. How often is patent foramen ovale an innocent bystander?. Clin Case Rep. 2017 Dec. 5(12):1992-4. [Medline]. Snijder RJR, Suttorp MJ, Ten Berg JM, Post MC. Percutaneous closure of a patent foramen ovale after cryptogenic stroke. Neth Heart J. 2017 Dec 4. [Medline]. The authors and editors of Medscape Reference gratefully acknowledge the contributions of previous coauthors Ahmed Alghamdi, MD, MB, BCh, FRCP(C) and Dawn M Calderon, DO to the development and writing of this article.